The papers of Sir Walter Bodmer have been intriguing, not only in terms of what they reveal about the history of science and genetics, but also for providing snapshots into the networks of co-operation, collaboration and relationships formed between prolific scientists. The large correspondence series of Sir Walter’s papers offer insight into how geneticists were continually learning from each other throughout their careers (and often disagreed), and through these exchanges of knowledge and ideas, lasting friendships were formed. The professional and personal correspondence between Walter Bodmer and Guido Pontecorvo (1907-1999) are one example of such a relationship. As a young graduate student, Walter Bodmer travelled to Glasgow with his wife Julia and two young children, to spend time in the laboratory of Italian geneticist Guido Pontecorvo at Glasgow University. Pontecorvo was head of the new Department of Genetics in Glasgow, which he helped to establish (like Bodmer, who would later be instrumental in initiating the Department of Genetics in Oxford), and Professor of Genetics from 1955 to 1968. Shortly after Bodmer completed his PhD in 1959, he became increasingly interested in the idea that quantitative genetics could be carried out properly on biochemical characters. Having learned about Pontecorvo’s work on Aspergillus, he hoped to travel to Glasgow and stay for a day or two to learn about this work and broaden his own outlook. In a report, Sir Walter wrote, ‘my reason for learning these techniques is a belief that they provide opportunities for a fundamental approach to the study of continuous quantitative genetics”. However, Pontecorvo firmly believed that basic biochemical and molecular genetics should be undertaken without the quantitative genetics. In addition, Pontecorvo was quite insistent that Bodmer would require several months (not days) to become acquainted with the techniques of biochemical genetics. My first contact with him was nearly 30 years ago when, under the influence of my Professor, Sir Ronald Fisher, I had developed an interest in quantitative genetics but felt the need for biochemical analysis. It seemed that the Aspergillus system would be a marvellous basis for this, so I asked my formal supervisor, Dr. Owen, to write a letter, which I drafted, to Professor Pontecorvo about this. Perhaps I could visit for a day or so in the first instance and explore the applications of the Aspergillus system. In those days it would have been unusual for a graduate student to write directly to the Professor. I still have his reply. In it he said, “I strongly dislike the subject of quantitative genetics in general, and in particular in micro-organisms, which are so much better suited for the study of variations in fine genetic structure and its correlation with fine differences in proteins”. He was, of course, right. Sir Walter has noted, “this was my first lesson in the value of persistence and calmness in relationships with others who may be much more senior than you are”. It was this experience with Pontecorvo that gave Bodmer his first exposure to microbial genetics and modern genetics studies using the Aspergillus system (in addition to ideas on somatic cell genetics, perhaps the most significant influence on Sir Walter career and a major stimulus for the Human Genome Project). According to Sir Walter, “Ponte’s pioneering insight that the asexual system of genetic analysis which he had developed for a fungus could be applied to human and animal cells in culture and laboratory” provided the fundamental background for later laboratory advances and applications at the molecular level. Indeed, the Bodmer archive contains a range of lab notebooks and papers from experiments using fusions to produce hybrids based on Pontecorvo’s method. Sir Walter has written, “though my time in Glasgow was short, I count myself as one of Ponte’s students”. In fact, Guido Pontecorvo and Walter Bodmer became very good friends; they would have a lot of contact during Pontecorvo’s later career after he moved from Glasgow to the ICRF in London at the invitation of Michael Stoker (Bodmer’s predecessor as Director of Research at the ICRF). In 1987 Sir Walter initiated and organised a symposium and special edition of Cancer Surveys in honour of Pontecorvo on the occasion of his 80th birthday. Francis Crick to Walter Bodmer, 18 May 1987 (Pontecorvo was known as ‘Ponte’ to his friends and colleagues). Guido Pontecorvo has remained an important influence on the career of many geneticists, with Sir Walter referring to him as “a true geneticist’s geneticist”. During the course of working on the Bodmer archive it has become clear that the collection documents not only the scientific work undertaken by Sir Walter and Lady Julia Bodmer in research laboratories across the world, but also how science and scientists dealt with the great geopolitical issues of the latter half of the twentieth century. This is well illustrated by the collaborative initiatives and visits conducted by scientists from both the East and the West during the Cold War. 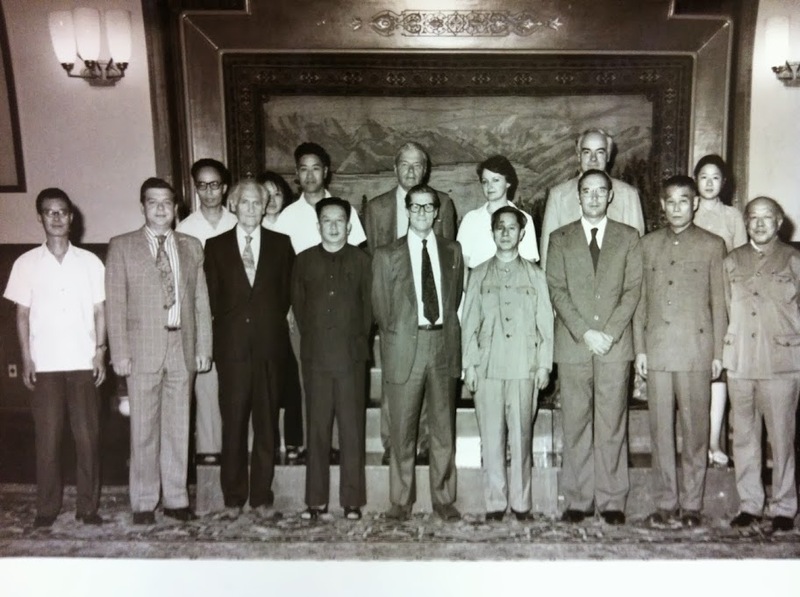 Walter Bodmer and fellow scientists undertook many such visits: an example of this being a Royal Society delegation led by Dr Michael Stoker, then Director of the Imperial Cancer Research Fund and Foreign Secretary of the Royal Society, to China between 17 July and 2 August 1978 (the first formal Agreement on scientific exchanges between the Royal Society and the Chinese Academy of Sciences being signed in November of that year). Along with Michael Stoker, the delegation comprised of Professor Walter Bodmer, Professor Sir Cyril Clarke, Professor Sir Richard Doll, and Professor Avrion Mitchison. Elizabeth Wright, Director of the Great Britain-China Centre, acted as advisor and interpreter as she was fluent in Mandarin Chinese (her language skills were particularly important to the team when they visited the south of China where Cantonese is spoken). As the report produced on the visit states, ‘though labelled as oncology we covered a fairly wide range of subjects from cell biology and genetics, to general clinical medicine, and back to butterflies, (the last two Sir Cyril Clarke’s interests)’. China at the time was just opening up to the outside world following the end of the Cultural Revolution and the downfall, orchestrated by Premier and Chairman Hua Guofeng, of the Gang of Four in October 1976. By 1978, with the emergence of Deng Xiaoping as the real power in China, reforms were well under way. In March of that year the National Science Policy Conference was held in Beijing. In a speech to the assembled 6,000 scientists and science administrators the by now Vice-Premier Deng declared science to be a productive force in society (contrary to the thinking of Chairman Mao Zedong and the Gang of Four) and that the Four Modernisations of agriculture, industry, national defence, and science and technology were central to China’s economic rejuvenation. On Sunday, 23 July the Royal Society delegation met Vice-Premier Fang Yi, Minister in charge of the State Scientific and Technological Commission, who also spoke at the National Science Policy Conference and in the following year was to become President of the Chinese Academy of Sciences. In Bodmer’s own personal journal of the visit he records, ‘First shake hands, pictures taken individually, then a group…pleasantries and then a sort of seminar on the role of immunology in cancer, a point raised by FY. We emphasised the importance of basic research and not to hope for too much…discussion about the exchange programme with Michael [Stoker] emphasising the need for high quality science and English’. Whilst in China, Bodmer himself visited the Academy Institute of Genetics, Beijing; the Medical Academy Institute of Oncology; the Fudan University Institute of Genetics, and HLA Workers, Shanghai; the Institute of Oncology, Canton; and undertook a rural visit to a pharmaceutical factory in Zhongshan [Chungshan] County. Of the Institute of Genetics, Bodmer records, ‘It was established in 1951. Before the liberation there were no institutes of genetics, only some professors in universities. Initially the institute was just a department mainly of plant genetics, was more formally established in 1959 to include animal genetics and after 1960 microbial genetics, at which time there were 100 people. Now the research personnel is 250…There are 5 departments which had been “adjusted” after the Gang of Four was smashed. This is the first of so many references to the difficulties that basic research faced under the Gang of Four when, it seems, many workers were simply not allowed to do any basic research and either simply studied political theory or went out to do practical work in the fields’. Despite these limitations Bodmer’s conclusions where on the whole positive, in his ‘General Impression’ Bodmer notes that, ‘Admittedly, it might seem all too easy to blame everything on the Gang of Four, but my impression certainly is of a really major setback during the ten years from 1966 to 1976. The able scientists and leaders now are a handful of those who were active before 1966 and who generally have had some training outside China’. 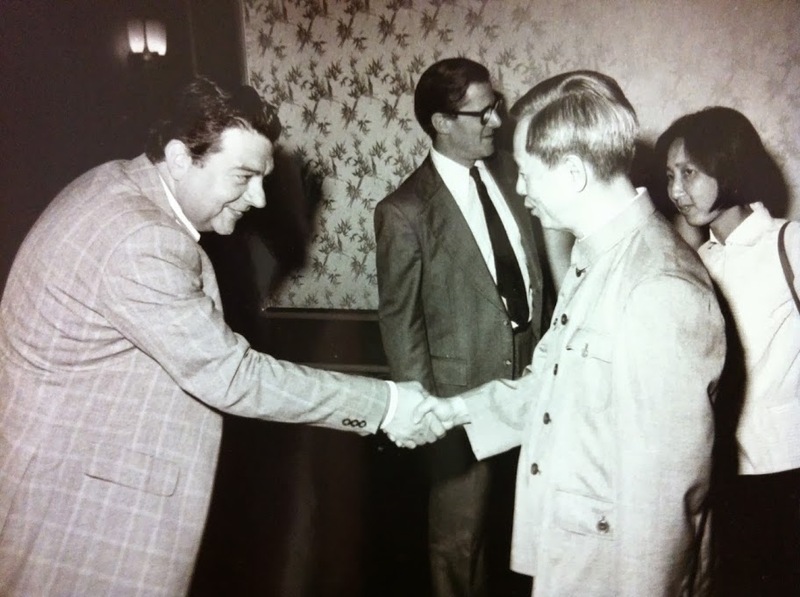 In a paper co-authored with Sir Cyril Clarke entitled ‘Medical genetics in China’, published in the Journal of Medical Genetics in 1979, Bodmer concludes, ‘Our overall impression was that though there was some good work being done, the Chinese often wanted to run before they could walk, a phenomenon also not unknown in the UK’. The material in the archive relating to this visit is only one example of a large number of papers relating to collaborations and visits between scientists at periods of great cultural and political change. Similar material documents future visits of Chinese scientists to the United Kingdom and the fostering of further links between the Royal Society and the Chinese scientific community. Included in the archive are also papers relating to the impact of the end of the Cold War in Europe and the breakup of the Soviet Union, along with a significant series relating to HLA workshops and conferences.